I’m not exactly sure why, but I always get homesick when I’m ill or stressed. And in the last few weeks, I’ve really wished I could just hop on a plane and go home. However it’s never as easy as that, so I have to find ways to “relieve” the homesick-ness. 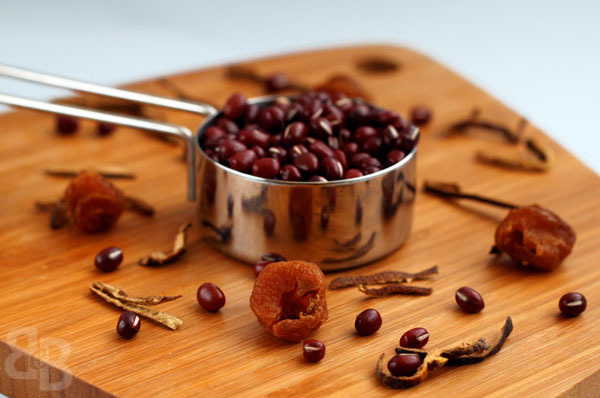 One dish that always reminds me of home is red (adzuki) bean soup, which I grew up eating. One sip of this humble soup or “tong shui” is enough to transport me back to my childhood, and back to Malaysia. At any rate, it has remained one of my favourite comfort foods (alongside tang yuan), and I make it everytime I miss home, or when it’s cold. Which actually translates into me making it pretty regularly….. The beauty about this dessert/tong shui is how simple it is to make. Like many traditional Chinese recipes, this is done by “feel” and estimation. I’ve personally never used a recipe for this, and have just thrown everything together – and it has always worked out. Always. I’ve included a simple recipe at the end of the post which can be used as a guide, but rest assured you do not need to stick to it religiously. To be on the safe side and be certain that the beans will soften, you should soak your red beans overnight. Strangely enough, the red beans I buy from Chinatown don’t need to be soaked overnight, but the ones I buy from non-Asian grocery stores (e.g. Tesco, Waitrose) have to be soaked. So, I only buy them from Chinatown now, as I never plan that far ahead when it comes to this! I also highly recommend using some sort of mandarin/orange peel in the soup. It adds a great citrus tang to the soup, and in my opinion elevates it to another level. I do hope you try making this, it’s simple and makes for a delicious dessert – regardless if you serve it hot, warm, or cold! * If you wish, you can add some tapioca pearls (sago) to this – simply cook 1 cup of tapioca pearls in hot boiling water (in a seperate pan). 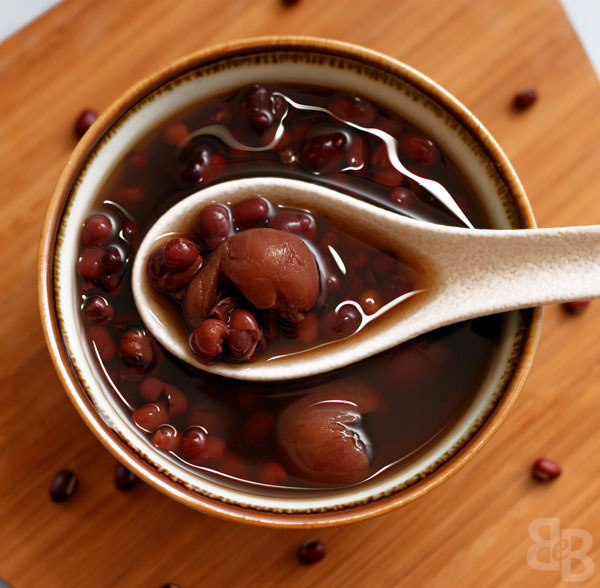 When they turn translucent, add them to the red bean soup, and you’re good to go! I love red bean soup! I agree that orange peel is a great addition, I love the mild citrus tang too. Definitely, it’s just not the same without the orange peel. I’m chuffed that I manage to demystify it for you! 😛 If you come to London I’ll definitely make this for you! Su-yin! Glad to see you back in action — in full throttle! I sometimes zip things up with either dried mandarin peel or pandan leaves. Either way, it always turns out great! Alright, enjoy the rest of 2010! Take care and stay warm, K? Happy New Year ahead to you! 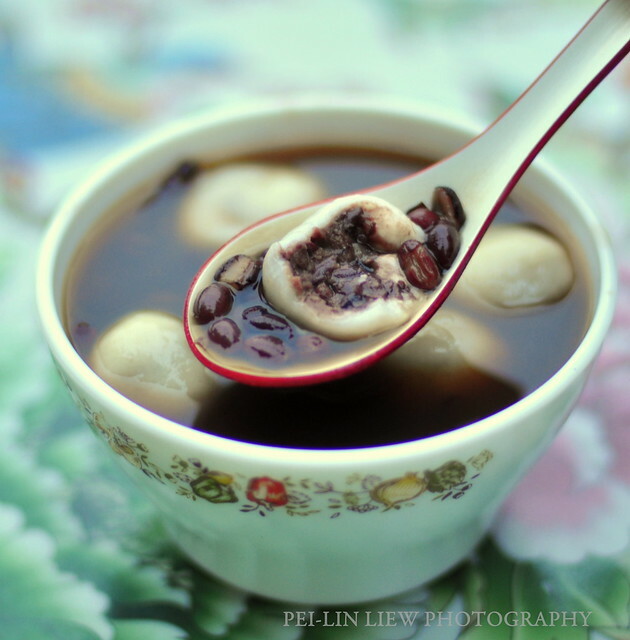 Just saw your post – your tang yuan looks yum! And it does look like great minds think alike, hehe. Hi Su-Yin. I read your About Me and wow, I’m from Malaysia too ! Anyway, mandarin peels really make red bean soup extra tasty ! By the way, try blending red bean soup with some ice, it’s really good ! Oooh that’s a fab idea, thanks for the tip! Red bean ice blended. 😉 Bet it could give Coffee Bean a run for their money. 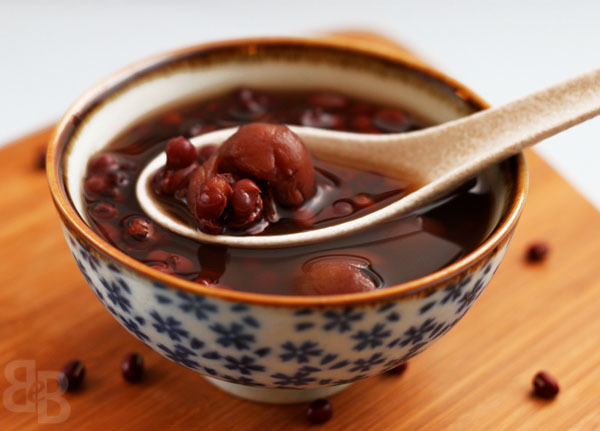 this is something different, i never had red bean soup with dried longan beforer but looks really nice. I will keep in mind to add them the next time i make red bean soup. Thank you for sharing. It is – definite comfort food, especially on a cold winter’s night! Loved your recipe + pictures and wondered if it was okay to make a link to your post. Thank you in advance. Hi Yvonne, yup that’s fine. Thank you for asking. I use brown sugar or palm sugar and drizzle with half and half before serving. Also great way to substitute sweet potato instead of the red beans… wonderful cold as well. Previous Previous post: A Taste of Green & Blacks, and a chocolate sheet cake!